E-Reader “Race to the Bottom” Given Extra Boost by Amazon, Copia? 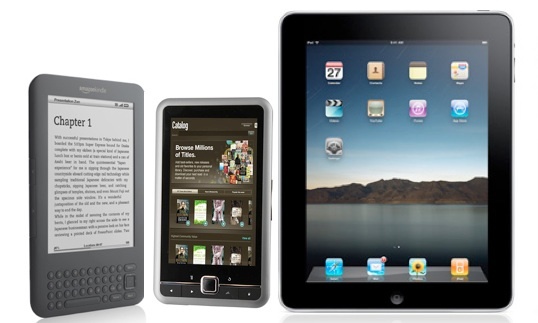 The e-reader may only have a short time in the limelight, as tablet PCs get better. This notion is given an extra kick by the devices ever-dropping prices–including the Amazon Kindle. We’ve called out the e-reader “race to the bottom” in terms of pricing before, noting that it may be a feature of the short lifespan these single-purpose gadgets may have on the average electric store’s shelves. Now Amazon’s dropping the Kindle price even more. The new Wi-fi-only Kindle costs a mere $140, $40 less than the Kindle 2’s most recent price, and it’s definitely a “breakthrough” price for the world’s most famous e-reader, which puts it right at the top end of many folks impulse-buy bracket, particularly if you’re talking about gifts, or the back-to-school purchasing period. But it’s not alone, and many budget e-readers, lacking Amazon’s huge Kindle e-publishing ecosystem, are pushing toward similar prices. Amazon’s big competition in the market, Barnes and Noble, are doing so too. And now there’s news that a company called Copia, a DMC Worldwide subsidiary, will be offering a 5-inch screen color e-reader at a mere $99 when its products hit the market later in 2010. That’s going to smart, since the Kindle is resolutely grayscale, and $99 is below that fictional $100 mental price barrier between something that seems expensive, and something that really doesn’t. The Wall Street Journal notes that it’s Apple’s aggressive pricing on the iPad that’s behind some of this. Before the device launched, skeptics argued it would cost close to $1,000, citing manufacturing costs and the famous, if misleading, “Apple Tax.” When the iPad’s entry price of just $500 was announced, it shook the mobile device world–and Amazon especially, since the figure wasn’t so very far from the then price of its big Kindle DX e-reader, which can do so much less than Apple’s gadget. The newspaper even cites a report by researcher company Forrester, which suggests that the price war between e-readers (our famous race to the bottom) will continue to be influenced by evolutions in the tablet market. So, just as we suspected, the race to the bottom is on, and Amazon’s along for the ride. Will it doom the e-reader totally, so much that in a couple of years they’ll be extinct? No. It may doom them to being a solely niche-device though, bringing their e-ink displays to situations that most benefit from them, while the tablet PCs mop up the rest of the slate-format e-reader market.